Using Monnit WIT wireless sensors provides peace of mind when it comes to knowing if any conditions come up at your business. We recommend using Monnit’s affordable wireless open/closed sensors to monitor doors and windows for un-authorized access. We also recommend using Monnit’s wireless temperature sensors and Monnit’s wireless water sensors to monitor for potential temperature and water damage. 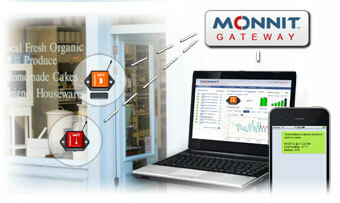 Visit www.mowisensors.com and download the Monnit Wi-Fi sensor setup application. Launch the Wi-Fi setup application.Note: The application is self-running and does not install on your computer. Create a new account if you are a new user or login if you already have an iMonnit account. Download the driver from http://www.mowisensors.com/downloads/CP210x_VCP_Windows.zip. Open the folder that was created and launch the appropriate driver installer. Click “Run” then follow the on-screen instructions to complete the installation. When finished, insert the USB side of the included cable into an available port on your PC. When inserted, your computer will automatically finish installing the USB driver. Insert two AA batteries into the MoWi sensor. The LED will flash green while the sensor looks for an authorized Wi-Fi network, then flash red if none is found. Plug the USB cable into a MoWi Sensor. When plugged in, the software will automatically update to show the sensor’s information. Select the Wi-Fi network you want to use the sensors on and enter the security credentials.If you don’t know your Wi-Fi network SSID, you can use the connected MoWi sensor to search for an available wireless network. To search, click the arrow to the right of the SSID field and select “Search for Networks”. The field will update with all available wireless networks. Select the one you wish to use. After selecting the Wi-Fi network, choose the type of security used then enter the pass phrase. If using an open (non-secured) access, no pass phrase is needed. When all information has been entered, click the “Assign Sensor to Wi-Fi Network” button. The configuration information will be programmed to the sensor and the sensor will be added to your iMonnit online account. When the process is complete, you will see a successful operation pop-up. Click “OK” to close this window. It is now safe to unplug the USB cable from the Wi-Fi sensor.